I have been looking for a marathon training program, and I found a few. So far it looks the most of the programs are about the same, I mean to say that the all look to follow the same basic principles running 4-5 days per week, slowly adding mileage with days of rest. If anyone has a recommendation please let me know your thoughts. Anyway, so far this week it been swimming, a light day on Monday and 1400 meters today. I am happy with the distance, but I have to work on breathing, so far I have been breathing on each right stroke. I have been working on every other right stroke, but I have to get used to the timing. So I have another thing to work on…. Trying to get out for a run tonight, but I waited until late to beat the heat, its currently 80 degrees outside. I got my run 3.2 miles, in the dark, my fav. just finished the Hope Springs Eternal 5K to benefit Hope Clinic. What a nice day to race, 09:00 start, it was about 60 degrees out, nice and cool for this time of year. I would guess approx. 200 runners came out for the 4th annual run. I had a time of 31:01, so a 09:59 pace, I know I am grasping at straws but it does sound better that 10 minute miles. Anyway I had fun and this isn't a bad time for me, my next 5k race goal is 29:59 or better. Today is a rest day, boy oh boy how hard is it to sit. I needed it though, I have been ramping up a bit, I have been working toward doing a Triathlon, and I needed the break. 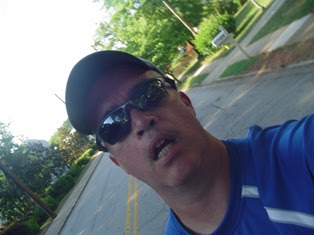 I am running a 5k in Decatur Ga tomorrow with a pal from the office. The weather looks good, should be about 55 at gun time. I am not sure of the terrain, other that it on city streets, but I mean I hope it's not all hills. I just decided to train to run a Marathon, and I can not believe it. The Walt Disney World Marathon in January looks to be super event for the first timer, it looks pretty flat, it looks like time will pass with all scenery, and the hard training months (Oct-Dec) are quite mild here in the Atlanta area. If anyone has run the WDW Marathon please let me know your thoughts. I am looking for advice, stories and inspiration, please help me with my journey.